Wednesday night, Concordia’s men’s hockey team will take the ice for their first round playoff matchup against the University of Ontario Institute of Technology Ridgebacks. Élément’s Stingers took on the Ridgebacks only twice this season, winning the first matchup 6-2 while dropping the second contest 5-3 during a late-season slump. The hard hitting Ridgeback team finished sixth in the Ontario University Athletics’ eastern division standings with strong performances from senior forward Ben Blasko and goalie Brendan O’Neill. Blasko’s 35 points in 28 games was the team’s only point per game performance of the season while O’Neill’s .925 save percentage in 15 games was fifth among U Sports goalies. The Ridgebacks have a talented roster, but Concordia are the favourites going into the best-of-three series. 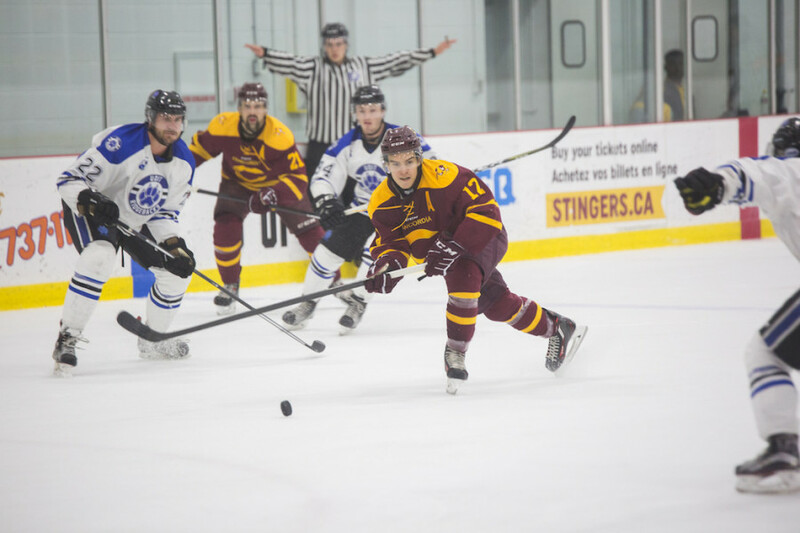 Finishing third in the division, the Stingers boast four point per game players in Anthony Beauregard (60 points in 28 games), Massimo Carozza (35 points in 28 games), Carl Neill (31 points in 28 games) and Philippe Sanche (22 points in 21 games). Beauregard, in particular, looks like a potential game-changer for the series. The forward led the league in both points and assists while finishing second in goals. In the first matchup against UOIT, he dominated the game scoring two goals and adding four assists. The Ridgebacks will definitely be wary of the potential league MVP candidate. “It’s fun, our confidence is really high. We wanted a really good weekend to jump into the playoffs,” said Element, noting how much of a difference there is between facing UOIT after a string of wins instead of feeling the way they did during the rough patch that preceded it. Related: Stingers End Their Season With a Win Over Carleton. The coach is doing his best to keep the team’s excitement up. Monday’s practice was held somewhere special for the team: The Bell Centre. “It’s not every day you get the chance to practice at the Bell Centre. It was just a little something I wanted to do before playoffs,” explained Element. The Stingers hope that taste of the big leagues is a motivating factor for them as they head into the most crucial part of the year. The Stingers visit the Ridgebacks Wednesday to open the series before returning home to host game two Friday night at Ed Meagher Arena.